The Vintage Heating & A/C Newletter for Winter 2010 is here. Newsletters are published quarterly and contain all kinds of energy information, savings coupons, and personal recipes that keep our tech's running like well-oiled machines. We test these recipes on them at lunch and so far... well, let's just say that nobody is losing weight. 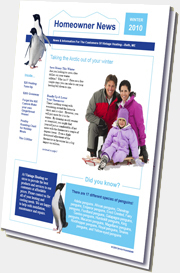 Click here or on the image to the right to view Winter Newletter. This requires the Adobe PDF Reader (download here). NOTE: The newsletter is a large file. Please be patient while waiting for it to be displayed.